Primary purpose of this article is to discuss Overall Equipment Effectiveness. 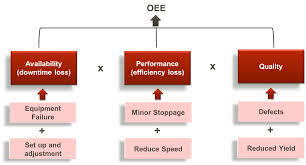 Overall equipment effectiveness (OEE) measurement is usually used as a key performance indicator jointly with lean manufacturing efforts to supply an indicator associated with success. OEE might be illustrated by a quick discussion of the six metrics that comprise the device. Measuring Overall Equipment Effectiveness is often a simple but effective measuring tool for obtaining details about what actually happens in your plant. Here also briefly focus on three factors of OEE: equipment availability, equipment performance and equipment quality rate.